First of all, we want to thank all of our donators for their support, each of our projects is only financed by donations and it is often the fact of little money that prevents a great idea to become reality. We promise to use each coin wisely and inform you regularly about the progress of this project. Second, we did it! Really. It’s true. The roof of future churchfortress headquarter, the former teacher house of Movile, is finally restored. Therefore, we only used traditional materials and craft techniques in order to keep the image of the village’s unique roofscape. As every time we invited regional craftsmen to help us with their fascinating skills and teach us some of them: Mulțimim, Nița și echipei tale! Attached you can see some pictures of our roof construction site. On the last one you will find a mysterious object at the end of the roof’s gable. 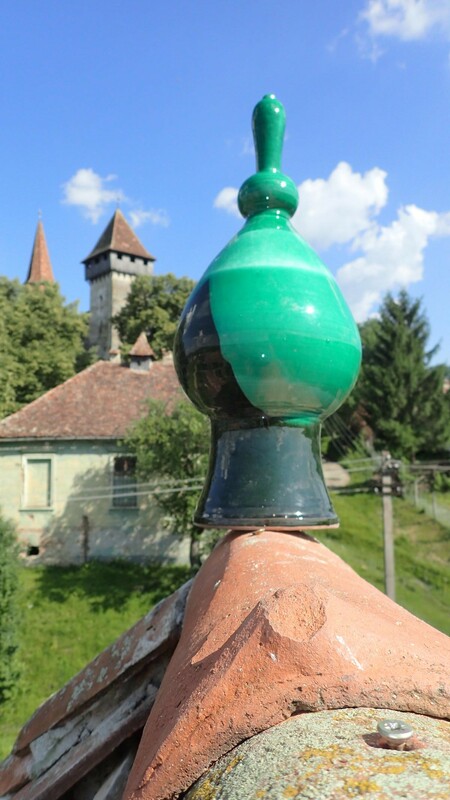 In the old days of Transylvania this symbol named Cocoş was installed after finishing the roof works at many houses in Transilvania in order to keep the bad spirits away. The Friends of Hundertbücheln / Movile want to revive this tradition in the village and offer a Cocoş as well as Know-How for traditional restoration to each villager, who wants to repair his or her roof in a proper way and help to keep the village’s unique image. 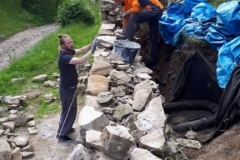 Right after finishing the roof we had to start another construction site, because a part of our Castle’s ringwall collapsed in wintertime due to heavy snowfall and there was a massive threat of a growing problem. With the infectious spirit of all together 20 people from Movile, Germany, Bavaria, Poland, England and France we organised a remarkable two week emergency action. 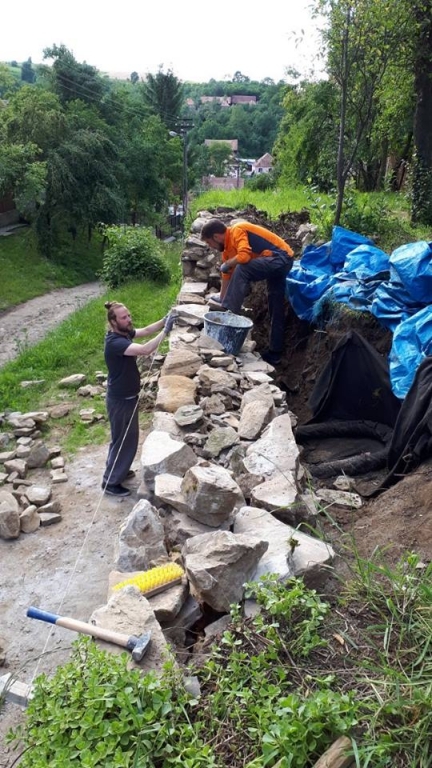 Although we had heavy… no seriously, heavy stones to carry, we managed it to restore a more than 5 meter wide section under professional instruction by regional craftsmen. 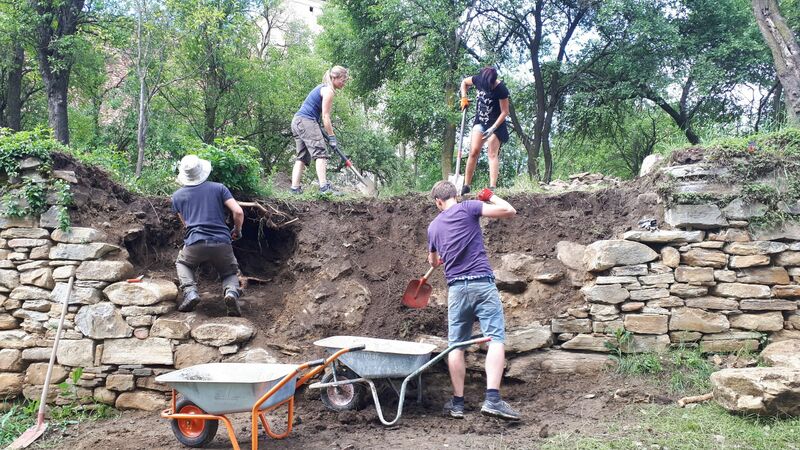 The result is a well-drained, two sided, cement-free stone wall that retains its function as an important habitat for rare specialised organisms of both, flora and fauna. Thank you once more, Gabi and Oscar, you helped us solve a big problem and keep Churchfortress Castle alive. See you next time in Movile! The next project is of completely different origin: After the first success of the “Hundertbüffel”-buffalo-project, we decided to change the German name of our village once again. 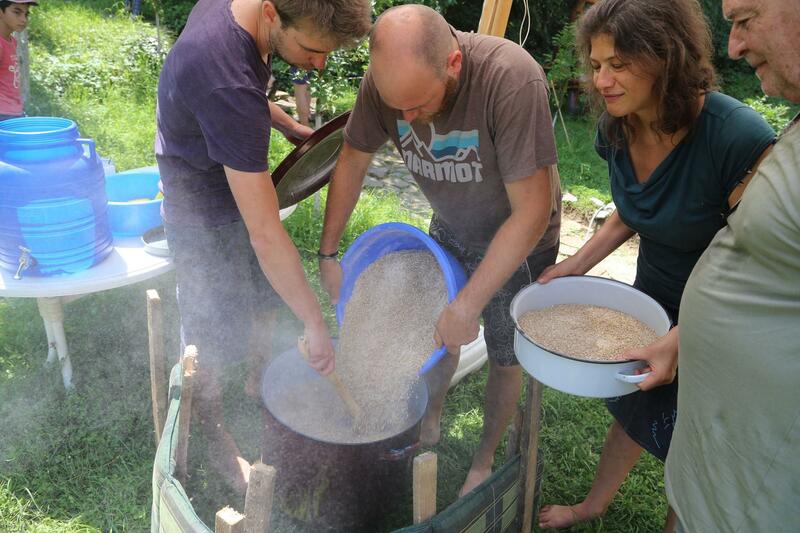 This time we chose the name “Hundertbierchen” and transformed the parish garden into a local beer brewery for two days. After some weeks of planning and organising all necessary equipment we invited our friends Padre and Angelika from Sibiu to help us at this special day. It was the remarkable day of the 26th of June Anno Domini 2018, when we made the impossible possible and produced the first beer of Movile and probably the whole Hartibaciu Valley by only using only hops, malt and water as well as the valuable knowledge of our master brewer Paul! Can you imagine the amazing smell that permeated through the beautiful village of “Hundertbierchen”? If you want to taste one of the hundred bottles of this local premium product, you should not miss the chance and visit the Transilvanian Brunch the end of September, organised by our fabulous friends Ania and Seba Bethge at Apold Castle. Project number four: stairway to the village museum. One later day Johannes, a well-skilled carpenter and honourable craftsman on a two years world travel, came by at our castle and offered his help for the Churchfortress Project. 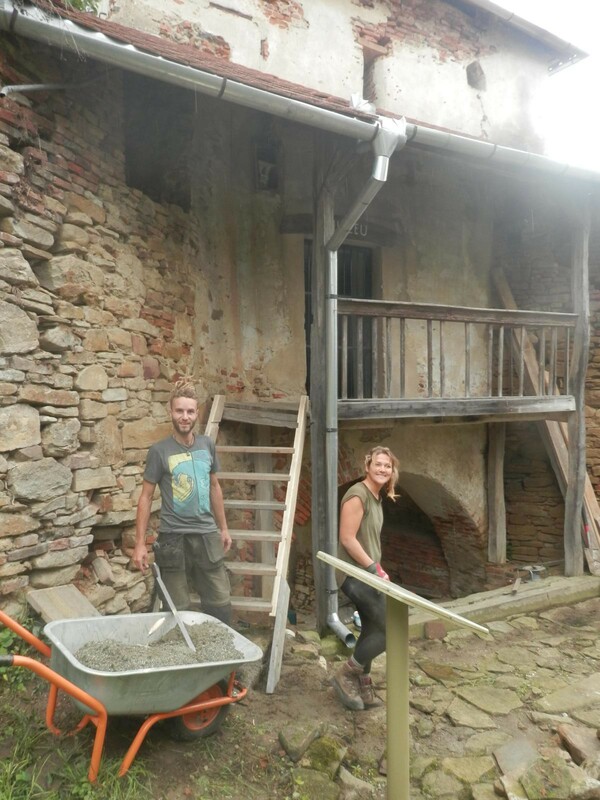 Only through this support we managed to renew the stairway to our little village museum in the first stage of the castle’s gate tower. Based on a stone foundation and following a smaller slope with fewer steps than the one before, the new staircase also allows older people to visit the museum now. Traditional craftsmanship, come by and have a look! 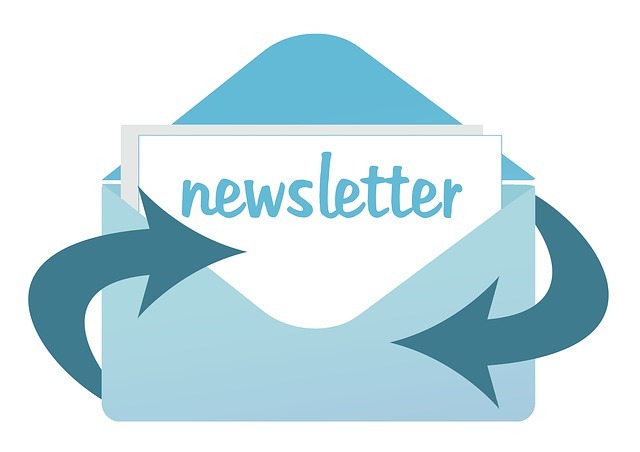 Have you already forgotten which had been the first project of this newsletter? No time to scroll up again, here comes another one. Made possible by your noble donations we could take another big step on the way to the conservation of traditional livestock breeds. The first Mangalitza piglets arrived in Movile! We are very happy to welcome our new hairy guys at our Castle. 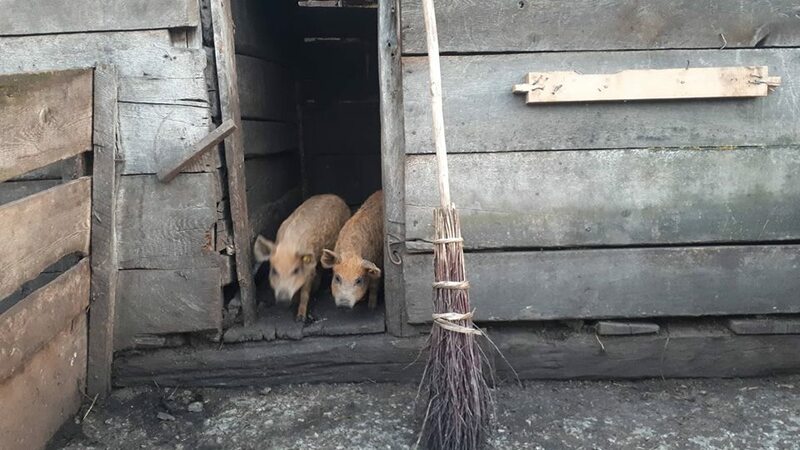 “Tante Doina”, one of our friends in Movile, will take care of them and try to become the best Mangalitza-Mama of the whole region. Thank you for your support! We keep on collecting money to bring back the Magalitzas as well as the buffaloes to the village and thereby help the people developing a sustainable future. Additional we have the first hints of the existence of another very rare traditional breed of the Transylvanian Saxons: the Baaßner Pig. They once were found in a lot of Transylvania’s villages but almost died out nowadays. If you want to help us to safe this traditional livestock and become a godfather or godmother for one of those animals, you are welcome to write us a message. 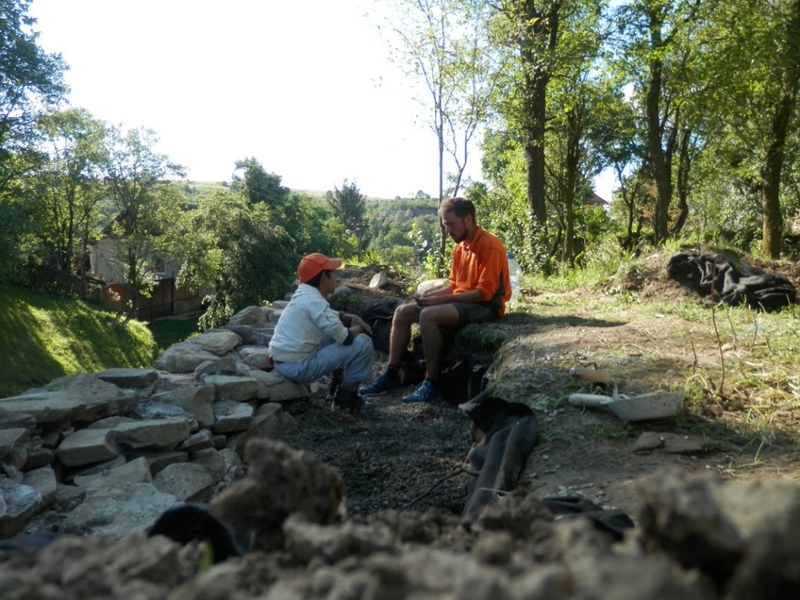 We will find a responsible villager who will directly benefit by your donation of 80 €. We will also arrange the donations of two or more Friends of Movile to be able to buy such an expensive but valuable animal as a water buffalo for more than 600 €. Still not tired? 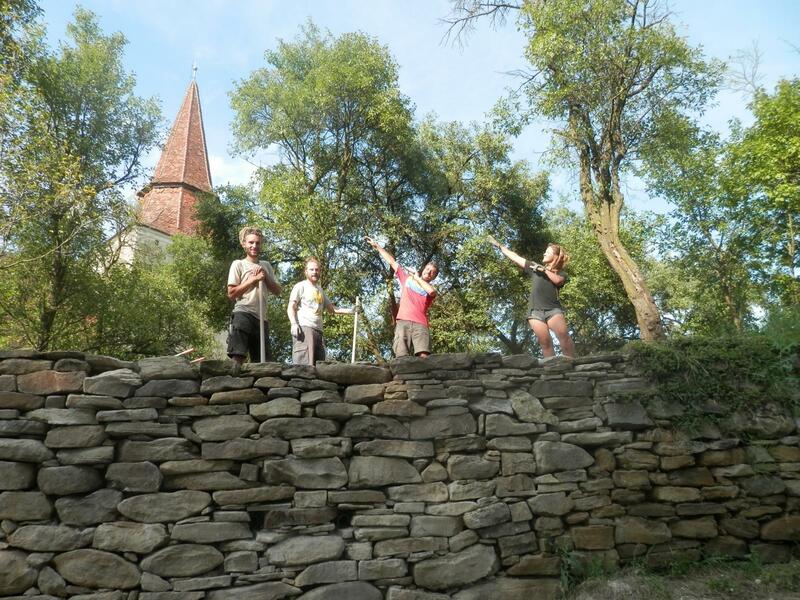 Here we go: We even managed to send Vicky, our highly motivated envoy, to the strong men at two workshops of the series “Hands on Conservation” which was organised by our partners from the Foundation of Fortified Churches. We appreciate to be able to enrich our knowledge of traditional craftsmanship by professionals in order to save the soul of Movile! In a few days, the Transylvanian Saxons prepare for their annual feast. More than one hundred former inhabitants of German origin come back to their birth place to remember the old stories and to keep their centuries-old traditions alive. It will be a week full of music, good food and interesting stories of the good old times. We also want to thank the Saxons of Movile for your open minds and your support for our colourful project! At the end of august it’s time for our annual churchfortress student week and we will organise an international landscape workshop in Movile with the title “Minds on Landscapes”. The application is currently open and there’s only one very last place for European students of landscape architecture, architecture, regional planning, ecology and related fields. If you are interested be quick and check our homepage, search on facebook or twitter or just write us an email. September 2018 will be under the star of art and music – stay excited. Moreover, this year will provide us a massive harvest of fruits like plums, apples, pears, apricots. Let’s see how we can process those quantities… So far for now, hopefully you manage to survive the heat and visit us once at our castle of the hundred hills.